External awning blinds protect against the heat of the sun. They absorb solar radiation even before it reaches the window and emit it outside, thus preventing an increase of temperature in the room. The solar VMZ awning blind covering a vertical window, in addition to protection against excessive heat gain inside the room, acts as an insect screen. When the window is open, the awning blind prevents insects from entering the interior. 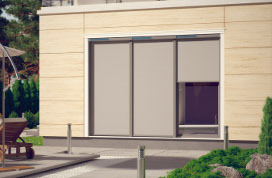 When pulled down, the awning blind ensures visual contact with the external environment. You can easily view the surroundings and yet have privacy from any observers who might be tempted to take a peek inside. The Solar Awning Blind is an innovative product equipped with an intelligent auto-run system which activates depending on the level of insolation. A photovoltaic sensor combined with the special electronic system reacts to solar radiation. In the summer, when large amounts of solar radiation are received, the awning blind rolls down automatically and protects the room from heat. In cloudy weather, the awning blind rolls up automatically, thus increasing available natural light. The awning blind absorbs solar radiation before it falls on the glass and prevents heat from entering the room. This provides much better protection against overheating than internally fitted accessories. The awning blind ensures up to 8 times more effective protection against heat gain compared to internal screens in addition to providing an influx of natural light and providing a view of the external environment. As it can be installed without the need for mains electrical power the VMZ Solar awning blind is the ideal solution for single-family houses as well as residential and public buildings. It is also ideal as an insect screen. A slide tape embedded in the edges of the fabric maintains the correct tension of the fabric between the guides and prevents it from falling out. This fixture increases its resistance to wind and can withstand wind gusts of up to 120 km/h and lateral winds of up to 220 km/h. The Solar awning blind improves ergonomic conditions. It provides a uniform distribution of light, ensuring comfort for the eyes and protecting them from the harmful effects of reflections, especially when working on the computer. In rooms with the awning blinds unrolled the eyes are far less fatigued than in rooms without blinds where the distribution of light tends to be very uneven.